"Is Your Room An Asthma Nightmare?" 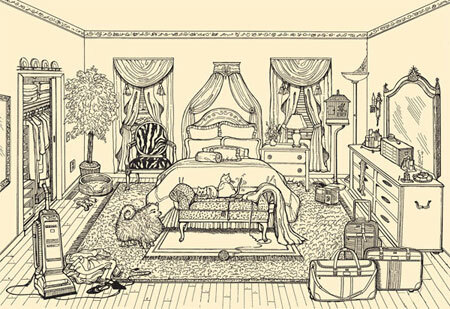 If your bedroom or other rooms in your home look a lot like the one below, you may be living in an asthma "nightmare"—an environment full of potential causes of asthma attacks. Many people with asthma have allergies that make their asthma worse. They may be allergic to dust, pollen, animal dander, mold, mildew—even cockroaches. Some people's asthma symptoms flare up when they are exposed to substances that irritate their airways, such as cigarette smoke; chemical odors; or cold, very dry air. If allergies or irritants make your asthma worse, you need to take a close look at your living (and work) space. For practice, take a look first at this picture. How Many of These Potential Asthma "Hazards" Did You Identify? (1) Bedding: Dust mites and other allergens (causes of allergic reactions) collect in pillows, mattresses, box springs, and comforters. Use zippered, allergenproof covers on these items. Wash all blankets, sheets, pillowcases, mattress pads, and uncovered pillows in hot water at least every 2 weeks. Avoid wool and down bedding. (2) Window coverings:Avoid heavy curtains and blinds; if you do use them, wash them often. Window shades are better. (3) Carpeting:Like heavy curtains, carpets are a magnet for dust mites and molds. It is best to remove all carpeting. If you can't, apply a special solution that inactivates allergens and/or kills dust mites. (4) Hot air vents:Cover these with a filter that cleans the incoming air. As an alternative, you can close the vents and use an electric radiator. (5) Cloth-covered furniture: Instead, use furniture you can wipe off-wood, plastic, metal, vinyl, or leather. (6) Outdoor ventilation:An open window lets in pollen, dust, and airborne irritants, not to mention the heat and humidity dust mites thrive on. Use an air conditioner with a filter that removes allergens. (7) Humidifier:High levels of humidity encourage dust mites and molds. The humidifier itself harbors molds. Instead, use a dehumidifier to remove moisture from the air. (8) Clothing clutter: Keep clothing in its place- in closed closets, drawers, and hampers. (9) Unused vacuum cleaner:This is a real trouble sign! Vacuum often, using (if possible) special bags and filters that trap allergens. (10) Pets: Bird feathers and droppings, as well as cat and dog dander, are common asthma "triggers." If allergies affect your asthma, it is better not to have pets. 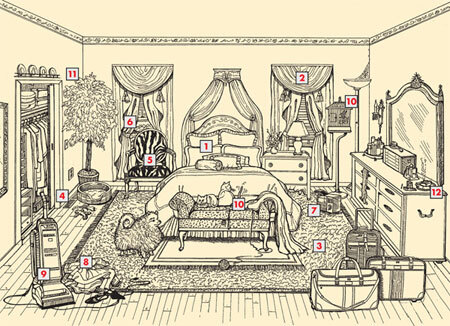 If you must have a pet, however, keeping it out of the bedroom may be helpful. (11) Dust catchers:Flowers and plants (natural or artificial), knickknacks, and dresser-top items, for example, attract dust. Eliminate as many dust collectors as you can. (12) Airborne irritants:Cigarette smoke is a prime offender. Hair sprays and perfumes also may aggravate asthma. Maintaining clean indoor air is important in controlling asthma symptoms. Some people use a high-efficiency particulate air (HEPA) cleaner for this purpose.